Thirty students representing Vermont eight high schools participated in the fourth annual Vermont Brain Bee on Saturday, February 9, 2013 at the University of Vermont College of Medicine. The event included written, practical and oral examinations, as well as a keynote lecture and neuroscience student discussion panel. For the first time, all of the Brain Bee participants qualified for the final rounds of the competition. Nora Enright, a sophomore from Otter Valley Union High School, clinched first place and was awarded funding to compete in the National Brain Bee in Baltimore. Second place and third place went to Gabriel Peck Frame, a senior from Champlain Valley Union High School, and John Mlcuch, a senior from Mount Abraham Union High School. The 2013 Vermont Brain Bee was co-presented by the Vermont Chapter of the Society for Neuroscience and the Neuroscience, Behavior and Health Initiative at UVM. 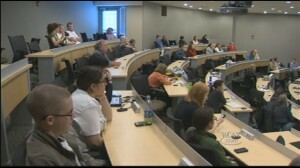 Learn more about the Vermont Brain Bee and view footage of the event from WCAX.